Kate earned in 2010 an associate degree in applied science in the physical therapy assistant program at Delgado Community College. 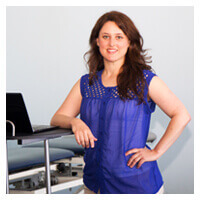 She has also been a licensed massage therapist since 2007, and has earned advanced certifications in orthopedic medical massage and myofascial release. Outside of physical therapy, Kate spends time teaching ballet, tap and jazz dance classes to children. Kate enjoys promoting health and wellness throughout the community, and also loves to practice yoga and pilates in her spare time.